Each instrument has a packet of audition materials available for download. You will download your respective instrument’s audition packet for specific audition requirements. Adobe Acrobat Reader is required to view each packet. Below are some of the most Frequently Asked Questions we receive regarding the Youth Symphony program and the audition process. A full orchestra is a musical ensemble that includes instruments from all four common instrument familes: string, woodwind, brass and percussion. Rehearsals take place at various locations throughout the area including area schools, universities and other facilities on Sunday afternoons from mid-August – May, except for certain holidays. All dates, times, and locations are subject to change. Concerts are held at the area’s most prestigious professional venues including Helzberg Hall at the Kauffman Center for the Performing Arts, the Folly Theater and Yardley Hall at Johnson County Community College. Additional venues include area high schools and community centers. Program fees range from $396 to $846 annually, depending on the orchestra in which your child participates. Our goal is to reduce barriers to participation – financial assistance is available for families with qualified need. Across the span of the year, ensemble fees equate to less than $10.00 per hour of instruction. See below about Financial Aid. See complete information on our Tuition and Fees page. The Youth Symphony thrives due to its parent volunteer program. Each family that participates in the program agrees to put forth 6 credits of volunteer time. Families have the option of completing these 6 volunteer hours or paying a fee of $150. The only other fee is the non-refundable audition fee of $20, payable upon registration. After the initial deadline of April 26, the non-refundable audition fee increases to $35. See complete information on our Tuition and Fees page. participate in his or her school band or orchestra program? No. The Youth Symphony of Kansas City is not designed to replace in-school music education programs. In fact, each student selected for the Youth Symphony program signs an agreement committing to participate in his or her school music program, when one is available, on the respective instrument he or she plays in the program. This requirement is strictly enforced. Yes! 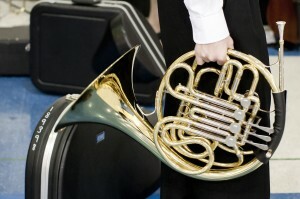 The Youth Symphony of Kansas City is committed to assisting students whose families demonstrate qualified financial need. Between $20,000 – 25,000 is provided annually for tuition assistance. Once the audition process is complete, a Financial Aid application form will be made available to all students offered a position in one of our orchestras. All applications are held in the strictest of confidence. No merit-based scholarships are available at this time. Does my child need to have a private instructor to participate? No. Private study is not required in order to participate, but it is strongly encouraged. Statistically, students who study privately audition more successfully. Young musicians residing within the Greater Kansas City Metropolitan Area and surrounding region who are beginning 5th grade through 12th grade. College students are not eligible. My child has never auditioned. Isn’t it difficult to get accepted? All students – regardless of previous program participation – are required to audition each year. This enables us to place all students based on ability at the level of orchestra that is right for them. Because we offer a comprehensive program at varying ability levels, most musicians participating in the program enjoy an enhanced orchestral experience. Percussion – UMKC Conservatory of Music, 4949 Cherry St., Kansas City, Mo. When will I know my audition date and time? Audition dates and times will be emailed to you after May 6. How long is each audition? Each audition is approximately 7 minutes in length. What if I need to request a different time? Please call the Youth Symphony office at 816-897-0577 or email us: rpieken@youthsymphonykc.org to request a schedule change. What will my child be asked to perform during the audition? Each instrument has a set of audition materials. See above for audition requirements and excerpts. How do you determine which ensemble is right for my child? Two independent adjudicators listen to every audition and recommend placement in an ensemble. Students will be placed based on their intonation, interpretation, tone, rhythm, technique and preparedness as demonstrated in the audition. Grade level and instrumentation needs of each ensemble may also be considered. Previous participation in the Youth Symphony of Kansas City does not guarantee ensemble placement. All students – regardless of previous program participation – are required to audition each year. All ensemble placements are final. Scoring, judge comments and recommendations are not discussed with students, parents, private teachers and/or music teachers.